By Jack Madden | February 25, 2014. Ireland’s hopes of winning an elusive Six Nations Grand Slam have been crushed in Twickenham following a devastating 13-10 loss to England. Ireland entered the game in England as the only unbeaten team in this year’s tournament following France’s heavy defeat to Wales on Friday night, but couldn’t carry their early tournament form into what proved to be a colossal physical battle. Joe Schmidt’s men started off slowly in the first half finding themselves on the back foot in a ferociously paced opening ten minutes, and were lucky to escape the first half only three points down following a penalty from English fly half Owen Farrell. There was little attacking brilliance from the Irish side who spent large chunks of the half camped out in defence, and were fortunate not to concede a try when a joint last ditch effort from Conor Murray and Andrew Trimble forced England’s impressive winger Jonny May to knock on in the corner. Ireland showed a glimpse of what they are capable of following a deft kick through by the ageing Brian O’Driscoll, which looked certain to result in a try if it hadn’t been for the impressive ball handling skills of man of the match Mike Brown. Ireland will perhaps feel aggrieved that Farrell was even on the pitch to kick the points that saw them down at half time, given that he had been penalised for a late hit on Conor Murray, which usually would have resulted in a yellow card based on the opinion of all but the referee Craig Joubert. Half time came and Ireland returned to the pitch knowing that they needed to up the intensity at the breakdown and recycle the ball in order to get back into the half, and this is exactly what they did. Following some smart phases of play through which the forwards provided, the grunt up front Jamie Heaslip fed the hard running Rob Kearney with a beautifully weighted pass, which saw Kearney finish with a try under the posts. Following a simple conversion by Sexton, Ireland found themselves pressing the self destruct button as they gave away the ball from the restart and just about held out in defence to stop a try. The English chariot had been awakened and was well and truly ready to roll forward. Two poor kicks from Jonathan Sexton would prove to be costly and ultimately led to the demise of a potential Irish victory. His first kick led to a penalty, which Farrell, who up to this point in the tournament had kicked quite poorly, expertly converted. From the resulting restart, Sexton sent the ball flying out on the full and the resulting play from an English scrum saw Chris Robshaw offload to the speedy Danny Care who scored under the posts, allowing Farrell to convert for a three point lead. Ireland were well and truly up against it and even though they showed glimpses of the set piece which so efficiently dismantled the Welsh two weeks ago, the scrum and maul from lineout were not enough to put a dent in what was truly an impressive and abrasively manned English defence. The English forwards were impressive throughout having lost star man Billy Vunipola early in the first half and Dylan Hartley and Courtney Lawes both carried well throughout. The star of the show however was fullback Mike Brown whose confidence under the high ball and general attacking prowess proved the difference in this tightly fought out affair. For Ireland, Gordon D’Arcy was impressive given the poor quality of the ball he received in the centre, and Devon Toner and Cian Healy both carried well in the loose. 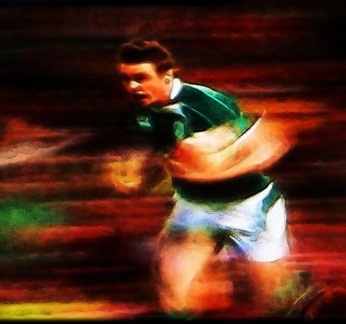 All in all a poor day out for the Irish was compounded when the great man Brian O’Driscoll, who was winning his 139th cap for his country and thus becoming the world’s most capped rugby player, limped off towards the end of a physical and energy sapping second half. With the Grand Slam off the cards, Ireland will return to the drawing board and look towards Italy at the Aviva Stadium knowing that a Championship is still on the cards, and are currently sitting top of the table thanks to point’s difference. Joe Schmidt will need to look at his game plan and the public will be expecting a few changes to be made in the squad for the Italy game with the likes of Simon Zebo, Luke Fitzgerald, Eoin Reddan and Donnacha Ryan all likely to be involved. A disappointing day out in Joe Schmidt’s first away game as Irish coach, and a sad way for O’Driscoll to finish out his final game against the English means that the Irish will be looking to bounce back versus the Italian’s at the Aviva and put their Championship aspirations back on track.